This year's Open at Carnoustie will take place on the longest course in the event's history at 7,421 yards. The Scottish links will play 60 yards longer than in 1999, when high scoring led to it being dubbed 'Car-Nasty'. However, officials hope the anticipated good weather and reduced rough will lead to a fairer test this July. Royal and Ancient chief Peter Dawson said: "We're not seeking carnage. We're seeking an arena where the players can display their skills to best effect." The course will be just 24 yards shorter than Augusta was for the Masters last month and only 140 yards shy of the major record, set by Medinah at last year's USPGA Championship. The 1999 Open was the highest-scoring Open since 1947 and the highest in any major since 1963. Scotland's Paul Lawrie emerged triumphant from a three-way play-off after he, America's Justin Leonard and France's Jean van de Velde finished on six over par. Van de Velde taking off his socks and shoes and wading into the Barry Burn on the final hole became the most famous image of that year's championship as he blew a three-shot lead. Tiger Woods, winner of the last two Opens, finished on 10 over to finish 10th, Spain's Sergio Garcia missed the cut on 30 over, and the entire field was a cumulative 3,746 over for the week. Is Carnoustie the toughest course on the Open calendar? While trees have been removed between the 7th and 14th fairways, other holes have been toughened up. The 3rd will play 16 yards longer at 358 yards, and has been made into more of a left-to-right dog-leg. The bunkering on the long 6th has been altered, the par-four 12th and 18th have been stretched by 20 and 12 yards respectively to 499 yards, and rough and mounding has gone in right of the 17th fairway. 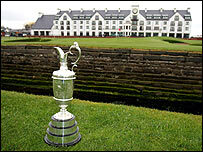 Dawson added: "Carnoustie deserves its reputation as the toughest course we use. But every player I have spoken to is excited about coming. "But this year we hope to achieve fast-running conditions (as was the case at Hoylake last year when Woods used his driver only once)." Woods, who won the Claret Jug at St Andrews in 2005 and at Hoylake last year, will begin the defence of his title on 19 July.